1. Put your contact info right up front. Don’t be coy. Put your URL so people can find you. Use your description wisely. Make a background using your logo, URL, and contact info. What your business is should not be a mystery, especially because it's so easy to just click on to something else. Make people want to stay and add you with a glance. Think of it the way you would your website; your Twitter account shouldn't only speak to those who already know who you are, but also to potential customers. 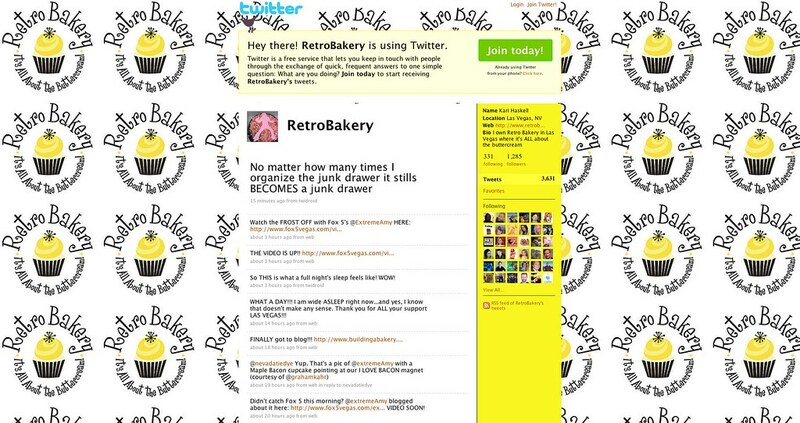 Retro Bakery (@RetroBakery) also has their logo on full blast. Both bakeries makes sure you know: a) they're a bakery b) they sell cupcakes. That's important. 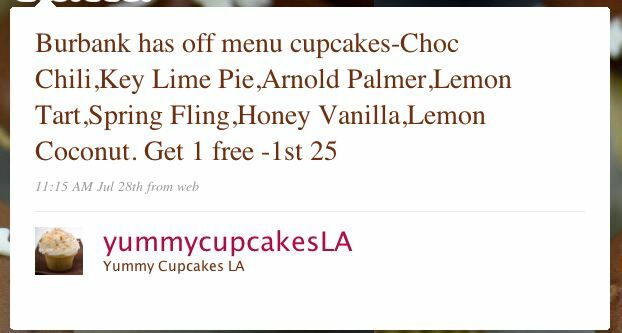 Yummy Cupcakes (@YummyCupcakesLA) offers same-day news about special flavors and free cupcakes. 3. Interact with other bakeries. 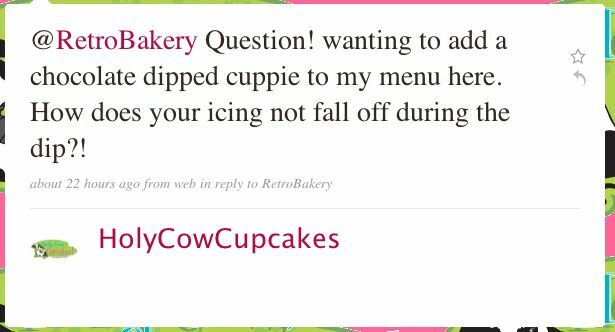 Holy Cow Cupcakes (@HolyCowCupcakes) asks fellow bakery Retro Bakery (@RetroBakery) a question. Twitter offers a wonderful opportunity to provide support to your fellow bakeries, see what they're up to, offer ideas and form a community. 4. Add photos to your background. 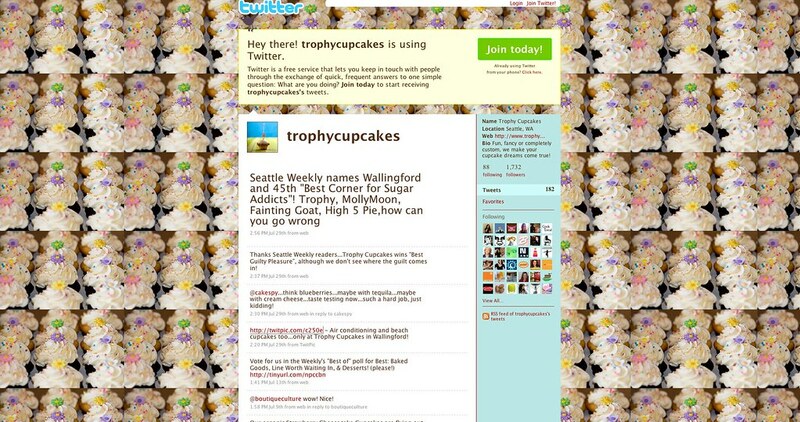 Trophy Cupcakes (@trophycupcakes) uses their cupcakes to grab people's attention. L's Cupcake Cafe (@LsCupcakeCafe) shows off their wares. Baked by Melissa (@bakedbymelissa) flaunts her mini cupcakes. 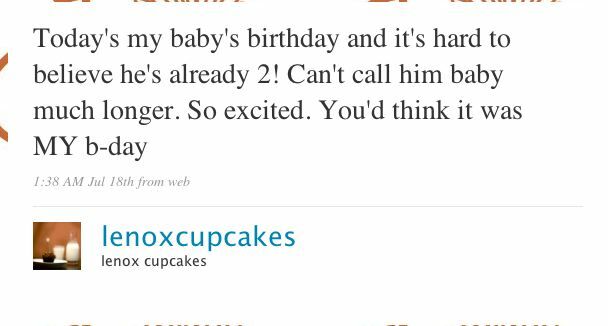 A hashtag means using the pound sign (#) before whatever you're posting, like #cupcakes, to make it come up in Twitter search easily or as a trending topic. If you're, say, making vegan cupcakes, you probably would want to tag #vegan - it's also a way to look up what other people are doing. Twitpic is a site that allows you to share photos directly to Twitter, with captions. You can email them to a designated email address from your phone or email account. This address could be shared with other employees and offers a way to give a visual, great for specials, custom cupcakes, anything new/fun/exciting. 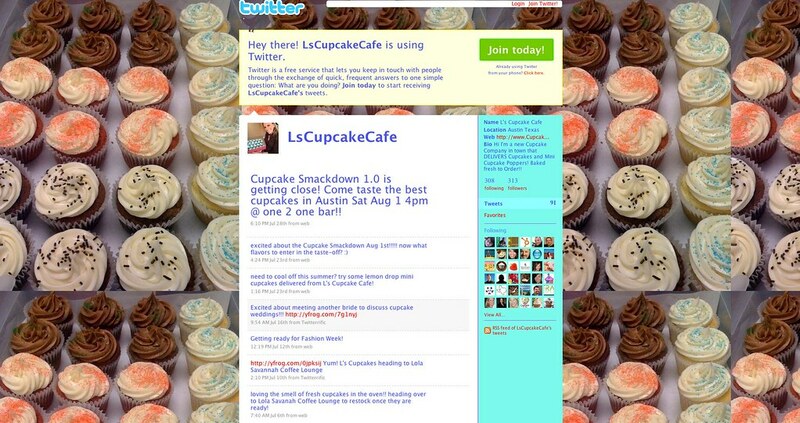 Portland's Cupcake Jones (@cupcakejonespdx) shares their latest cupcake flavors via Twitpic. 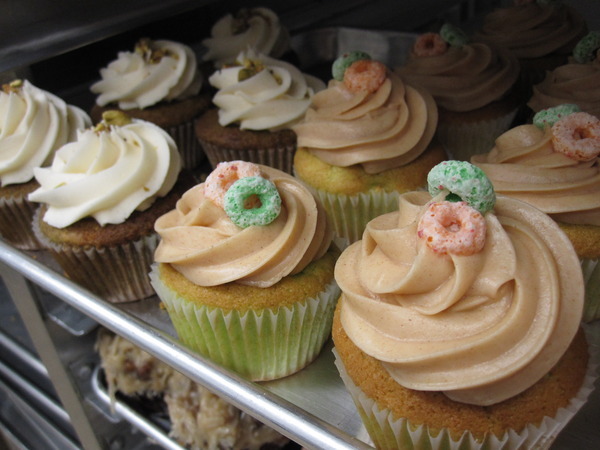 Flour & Sun Bakery (@flourandsun) Twitpics their specials: Pistachio, Apple Cinnamon, Creamsicle. 7. Tweet about things other than what you’re selling on occasion. Make it interesting. 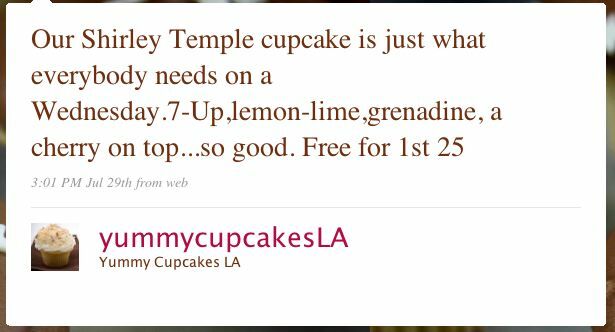 Yes, it's great that you have new cupcake flavors, sales, etc., but Twitter is a wonderful opportunity to give a little behind-the-scenes information and personality to your bakery. What's cool about working there? What's aggravating? What ingredients are you procuring? What's going on in your town/life that you're excited about. I'm not suggesting you go totally off-topic, but, like a blog, make it something readers/followers look forward to seeing. The Shoppe Denver (@theshoppedenver) offers sweet cupcake dreams. 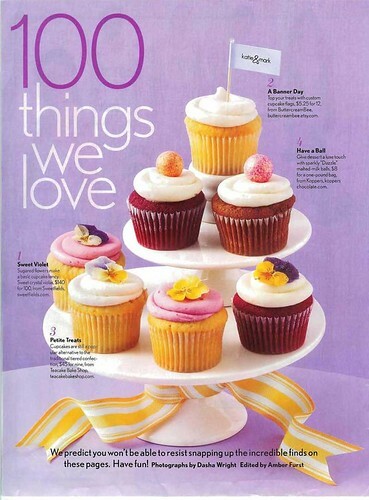 Lenox Cupcakes (@lenoxcupcakes) offers a personal milestone. The Bleeding Heart Bakery (@Bleeding_Heart) regularly answers customer questions and replies to them on Twitter. General advice that probably goes beyond Twitter: Engage. Be involved. Don't be one of those bakeries just racking up followers and not following anyone back. Yes, you can do that, but then you miss the opportunity you have to find out exactly what your customers, and potential customers, are talking about and doing. Use search to find out who's talking about your bakery, or a specific topic you're interested in. Reach out to them. Explore. We're @cupcakeblog and would love to hear from customers and bakers what's worked for you with Twitter, what you love, what you hate, etc. These are just some ideas. We'd love to hear yours! And also, Twitter only works when you have people reading. 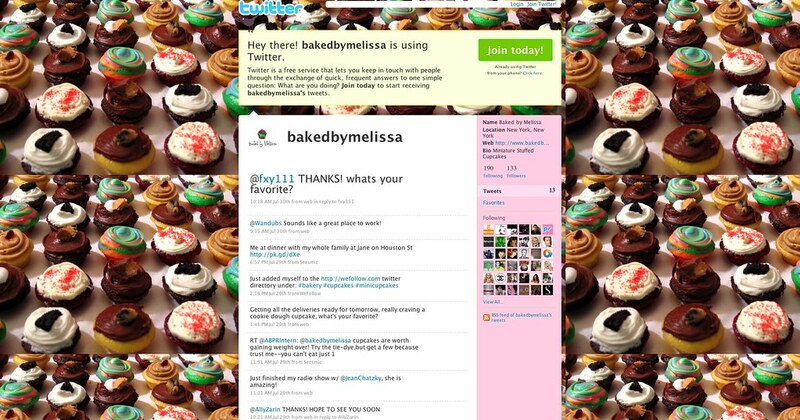 Spread the word to your customers in your bakery, newsletter, other social networking sites. Follow your local news sources, blogs, restaurants, organizations, etc. See who you might be able to partner with or whose events you can sponsor. The point is to get people talking about you, and one thing I love about Twitter is how fast something can get Retweeted, simply by asking. But the catch is, you have to have something worthy of Tweeting. On that note, happy Follow Friday everyone! Great post, and you finished it quickly! =) Thanks! Totally agree with point 7. I don't follow bakeries that only tweet specials. Guess I would if I was just looking to buy cupcakes, but I'd much rather have an opportunity to interact - that's what Twitter is all about. Another tip - integrate Twitter with your existing online content. Allow people to tweet your confections to friends as a gift for a party/wedding. This was very helpful! 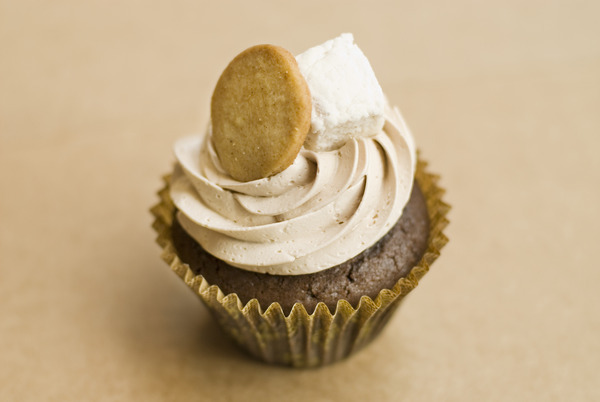 And that smores cupcake looks amazing! thanks for posting such an informative article! 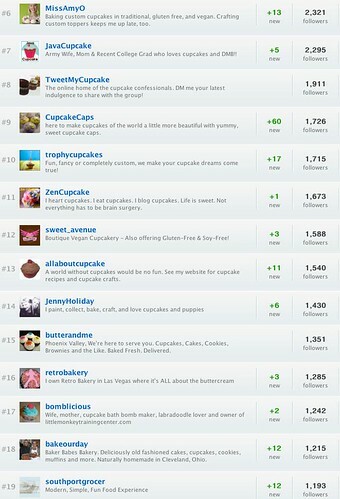 The Twitter community has been wonderful for my cupcake company in so many ways. Sure, sales have been great just from Twitter form collaborating with other bakers and sharing in our successes and challenges has been huge! This was very handy! thnx!